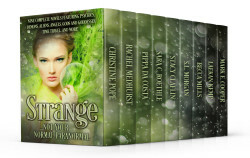 Nine Complete Novels Featuring Psychics, Demons, Aliens, Angels, Gods and Goddesses, Time Travel, and More! Dive into nine different worlds that aren’t your normal paranormal. These aren’t your run of the mill vampire, werewolf, and witch stories. Immerse yourself in these unique, full-length novels from national bestselling authors.